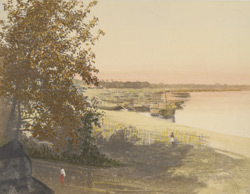 A hand-coloured print from the Fiebig Collection: Views of Calcutta and surrounding Districts, taken by Frederick Fiebig in 1851. This is a view of a scene on the banks of the River Hooghly with many boats moored. The ghats are used as landing places for boats and for people to perform their ritual ablutions. The Hooghly is the most westerly and commercially important arm of the Ganges river. Calcutta is a city and port in eastern India and the capital of West Bengal. It was founded in 1690 by the British East India Company on the banks of the Hooghly River. The port provided access from the sea to the hinterland of Bengal, India’s richest province. In little more than half a century the original trading port grew into a considerable city, clustered round the Company’s fort.